As representatives of Kinetics Noise Control, we can supply a wide range of products for your Home Acoustics needs! 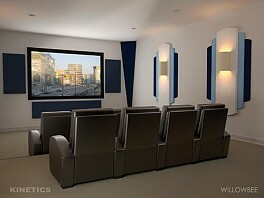 Kinetics Home Theater specializes in residential room acoustics and soundproofing. Typical applications include home theaters, media rooms, and home recording studios. Our noise control solutions offer peace and quiet from these and other "noisy room" environments such as fitness and laundry rooms, stone and hardwood flooring, and music rooms for instruments such as drums and electric guitars. Please visit Kinetics web site here for more information.